The Kellogg House renovation and expansion project began in 2010 with the College issuing a Request for Proposals for architectural services for programming, design, and construction administration of the Kellogg House project. Black River Design won the project with a proposal submitted in early 2011 and began design work shortly thereafter. This site will serve to chronicle the progress of the Kellogg House project and highlight the innovative aspects of the project that will make Kellogg House one of the best performing buildings in the United States. Before reading other posts on this blog, take a moment to review the information below, which includes: the project’s purpose statement, a brief explanation of the Living Building Challenge, and the key players for this project. Our purpose is to regenerate the historic Kellogg House as a home for the Center for Environmental Studies and the Zilkha Center for Environmental Initiatives, so that students, faculty, staff and our neighbors are inspired to engage in local and environmental issues to help bring positive change. It will be inspired by functionality, scientific principles and artistic vision, and the excitement of discovery, in a way that supports the academic and operational missions, promotes learning about a holistic approach to the design and building process, strengthens the community, serves as a model for the college and community and attracts interest. In light of this project purpose and the new building guidelines adopted by Williams, the College administration decided to pursue the Living Building Challenge for the Kellogg House project. A PHILOSOPHY, ADVOCACY PLATFORM AND CERTIFICATION PROGRAM. Because it defines priorities on both a technical level and as a set of core values, it is engaging the broader building industry in the deep conversations required to truly understand how to solve problems rather than shift them. An EVOCATIVE GUIDE. By identifying an ideal and positioning that ideal as the indicator of success, the Challenge inspires project teams to reach decisions based on restorative principles instead of searching for ‘least common denominator’ solutions. This approach brings project teams closer to the objectives we are collectively working to achieve. A BEACON. With a goal to increase awareness, it is tackling critical environmental, social and economic problems, such as: the rise of persistent toxic chemicals; climate change; habitat loss; the collapse of domestic manufacturing; global trade imbalances; urban sprawl; and the lack of community distinctiveness. A ‘UNIFIED TOOL’. Addressing development at all scales, it can be equally applied to landscape and infrastructure projects; partial renovations and complete building renewals; new building construction; and neighborhood, campus and community design. A PERFORMANCE-BASED STANDARD. Decidedly not a checklist of best practices, the Challenge leads teams to embrace regional solutions and respond to a number of variables, including climate factors and cultural characteristics. A VISIONARY PATH TO A RESTORATIVE FUTURE. Site – The intent of the Site Petal is to clearly articulate where it is acceptable for people to build, how to protect and restore a place once it has been developed, and to encourage the creation of communities that are once again based on the pedestrian rather than the automobile. Water – The intent of the Water Petal is to realign how people use water and redefine “waste” in the built environment, so that water is respected as a precious resource. As part of this petal, net-zero water use is required. Energy – The intent of the Energy Petal is to signal a new age of design, wherein the built environment relies solely on renewable forms of energy and operates year round in a pollution-free manner. As part of this petal, net-zero energy use is required. Health – The intent of the Health Petal is to focus on the major conditions that must be present to create robust, healthy spaces, rather than to address all of the potential ways that an interior environment could be compromised. Materials – The intent of the Materials Petal is to induce a successful materials economy that is non-toxic, transparent and socially equitable. Equity – The intent of the Equity Petal is to correlate the impacts of design and development to its ability to foster a true sense of community. Beauty – The intent of the Beauty Petal is to recognize the need for beauty as a precursor to caring enough to preserve, conserve, and serve the greater good. To be certified as a Living Building, a building must meet the requirements of each of the twenty imperatives over the course of a continuous year. Thus, the certification is contingent upon actual performance rather than modeled performance. This requirement ensures that a Living Building truly performs to a high standard. As a result, only four buildings in the United States have achieved the LBC certification, and we estimate that between fifty and hundred buildings are currently striving to meet the LBC. The LBC meshes nicely with the College’s sustainability goals, CES’ mission, and the history of Kellogg House as a building that has been moved, reused, and revitalized several times. In future posts, this blog will highlight how the project achieves the various requirements of each petal of the LBC and meets the goals outlined in the Building Committee’s mission statement. The Kellogg House Building Committee and Black River Design are the two main entities responsible for making sure Kellogg House satisfies the intent of the purpose statement. Under each of these two groups are an array of engineering firms, consultants, and other entities that will contribute to the success of the Kellogg House project. The following diagram highlights the main players and the relationships among them. 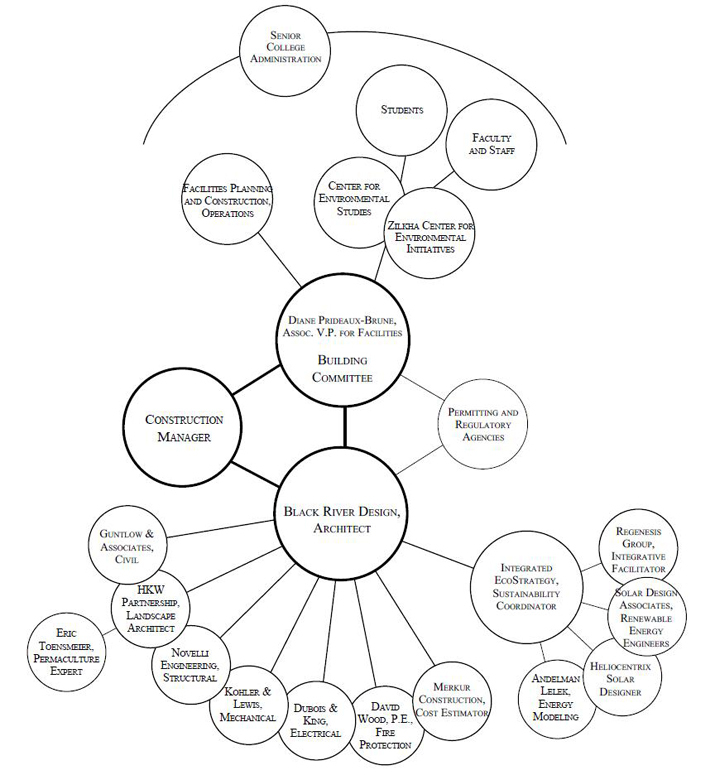 Organization chart for the Kellogg House construction project. Blogging services provided by Integrated Eco Strategy.